Good news and bad news, which one do you want to know first? Well, one by one. The bad news is that the headachy problem of iPhone battery life drain issue still remains in suspense, unsolved even in Apple 10th anniversary iPhone 8/Plus. The good news is from the newly released iOS 11, which brings some new features to let you exceedingly free up storage space on iPhone X/8/Plus/7/7+/6s/SE/6/5s (esp for 16/32 GB model) as long as you update to iOS 11. What are they? How to use them to save storage on iOS 11 iPhone x/8/Plus/7/6s/6? Calm down! The below post will guide you to use iOS 11 new features to optimize iPhone storage on iOS 11..3, 11.2 or 11.1. Read on. If there is nothing else you can do to free up space on iPhone, try MacX MediaTrans to sync and backup iPhone files to Mac/PC, incl. music, video, photos, iTunes movies, ringtones, ebooks, etc without using iTunes/iCloud. Save 50% or more storage. For the past couple of years, Apple has been using H264/AVC codec to encode camera video. Yet, as the 4K video recording feature appears, the 16GB/32GB iPhone users find it's very easy for 4K videos to consume their iPhone storage. One minute of 4K video shot by iPhone 6s occupies 375MB. And only 2-3 hrs 4K video can eat up your 32GB iPhone space. In such case, Apple is pushed towards to a solution with both compression and quality in mind. Which one is the best alternative to H264/AVC codec? High Efficiency Video Coding (HEVC) is the best choice. The video encoded with HEVC (H265) can lose file weight around 50% compared with H264 while remaining no quality on video quality. Thus, you can save 50% storage space when taking videos using the iOS 11 camera app. Of course, theoretically, it's also a no-brainer to play HEVC on iPhone 8/Plus/7/6s/SE. The same applies to take and save pictures as HEIF (not JPG) via iOS 11 camera app. ④ Opt for "High Efficiency"
⑥ Check photo or video format and file size. 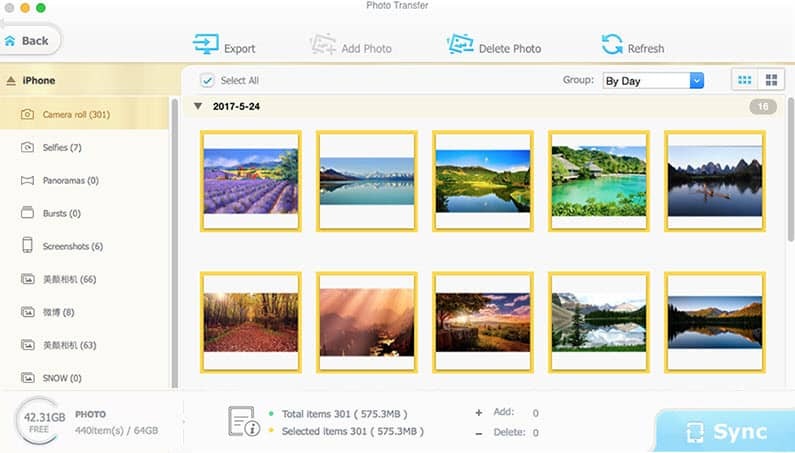 The first iOS 11 new feature can help you compress photo and video size up to 50%, which can dramatically free up space on iPhone 8/Plus/X/7/6s/SE. However, it is just a temporary solution in terms of your countless photos and HD videos. To manage your huge library of photos and videos, the ultimate solution is to make choice: accept some and reject some. ④ Enable "iCloud Photo Library"
⑤ Empty "Recently Deleted" album under Recommendations. ⑥ iOS 11 automatically detects clearable large files and clear them up at full speed. ② Click "iTunes & App Store"
③ Scroll down to enable "Offload Unused Apps". ④ Toggle white switch of "Offload Unused Apps" to green under Recommendations. ⑤ Manually uninstall apps one by one. Choose apps from the displayed list and tap on "Offload App" on the app detailed info page. 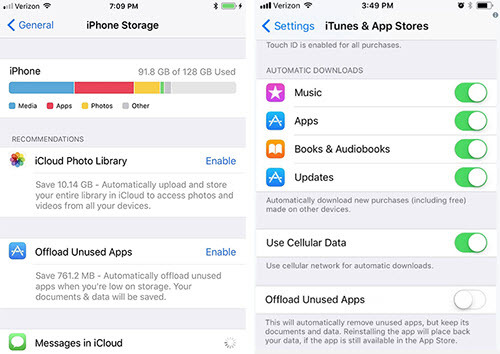 Though this iOS 11 space cleaning feature auto deletes unused apps from your iPhone, it doesn't get rid of your data files from app. Instead, it will auto upload data to iCloud for backup. Plus, the deleted app icon is still kept on your mobile desk, which is convenient for you to reinstall this app and regain its previous data via a slight tap on icon if you need it again in some day. 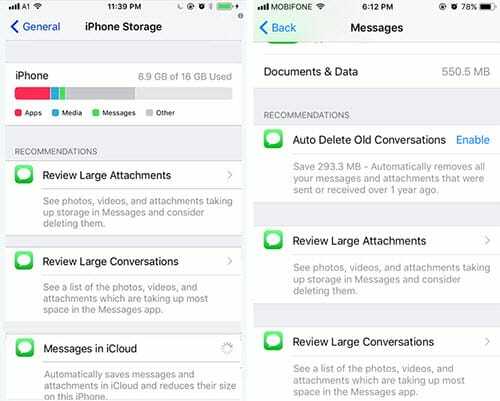 After trying the above methods to free up space on iOS 11.3, 11.2 or 11.1, if you are still low on storage, you can further manage your message conversations on iOS 11 to optimize iPhone storage. This method is also applied to speed up iOS 11 on iPhone iPad. ② Click "General" > access to "iPhone Storage" or choose "Messages"
* Enable "Auto Delete Old Conversions" to delete old content after a year. * Select "Review Large Conversions" and "Review Large Attachments" to see which conversation takes up space most and rank & delete them one by one. * The recommendations "Review Large Conversions/Attachments" similar to those in Message. No need to explain it again. * Another recommendation "Messages in iCloud" suggests you to auto save messages to iCloud so as to reduce their size on iOS 11 iPhone 8/Plus/7 and more. iMessage is usually a neglected place that you might not think of when freeing up iOS 11 storage. Yet, it does render help for you esp for 16/32GB iOS 11 device. When you can't decide which picture or video to delete, delete old message conversations to free up space for iOS 11 updates, for it needs 1.82GB extra room. If Message doesn't offer you enough room, try moving images, videos, etc. to PC. 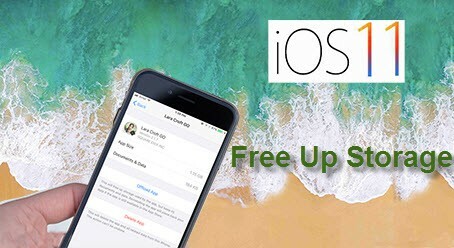 Yes, the aforementioned smarter tips and tricks to free up iPhone space belongs to iOS 11 iDevice. 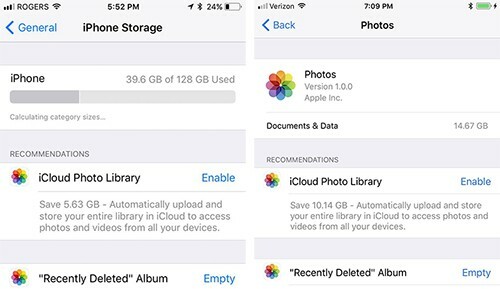 To save storage on iOS 11 iPhone 8/Plus or other models, the most effective way is to backup important yet big photos, music, videos etc to computer and delete them from iDevice. To optimize iPhone storage on iOS 11 easily and quickly, MacX MediaTrans is the one you need. > Transfer videos, music, photos, iTunes purchases, eBooks, etc. from iPhone to PC to free up space & backup for fear of data loss. > Bulk delete cameral roll, music library, movie collections etc from iPhone or iPad in one click. > Intel QSV hardware accelerated speed to sync iPhone data to PC at fastest speed, 100 4K pics only 8 seconds needed, no files missing during process. > iPhone manager to make music playlist, batch edit music info, make ringtones, batch delete songs/video/photos, remove DRM from iTunes purchases, etc. Connect your iPhone to computer via USB cable. Afterwards, do what the pop-up message asks you to do to adjust iTunes settings lest iPhone file data is missing during file sync. BTW: the whole process will not use iTunes to do the iPhone backup stuff. It just needs iTunes to detect iPhone. Click Photo Transfer/Music Manager/Video/Book/Voice & Ringtone or Remove DRM on the main interface according to your specific needs. Here we take iPhone photo transfer for instance. Opt for the iPhone pictures you wanna transfer to computer. Select picture one by one or just tick "Select All" sorted by Day/Month/Year. Tap "Export" button and this iPhone cleaner will begin to export photos from iPhone to Mac/Windows computer. The "Delete" option here allows you to bulk remove unwanted photos from iPhone to save storage on iOS 11 iPhone 8/7/6s. MacX MediaTrans, whose primary feature is to backup and transfer iPhone 8/7/6s/SE files to computer to whopping clear up space on iOS 11, including photos, music, movies, videos, iTunes DRM purchases, ringtones, ebooks and more without using iTunes/iCloud. No limits on time and space. Is It Worthy to Upgrade to iOS 12?